Best dressed: Who wowed on the NASCAR red carpet? This weekend you got to see your favorite drivers dressed up in a different kind of suit … one that’s probably a little less comfortable than their usual attire. We take a look at some of the best-dressed couples at the 2013 NASCAR Sprint Cup Series Awards. Kurt Busch and girlfriend Patricia Driscoll receive the "Risk Taker" award. Kurt’s the only one you’ll see in a pinstripe suit perfectly matched to his date’s dress. Nice job, Patricia! We applaud a pregnant Katie Kenseth for stepping out on the red carpet. She looks beautiful and proves the phrase "pregnancy glow" is a real thing. We also love the leopard clutch … and her arm candy, Matt Kenseth. Lorra Podsiadlo shimmered in a gold dress … or was that the love for new fiance, Clint Bowyer, radiating from her? Either way, we give them both a 10! It was no secret Dale Earnhardt Jr. loved girlfriend Amy Reimann’s orange dress. We agree. She looked gorgeous next to NASCAR’s most popular driver. We can always count on the fashionable Samantha Busch. Her vintage glam look was perfect from head to toe. Ingrid Vandebosch’s dress reminded us of something from the set of "The Great Gatsby." But with an edge. 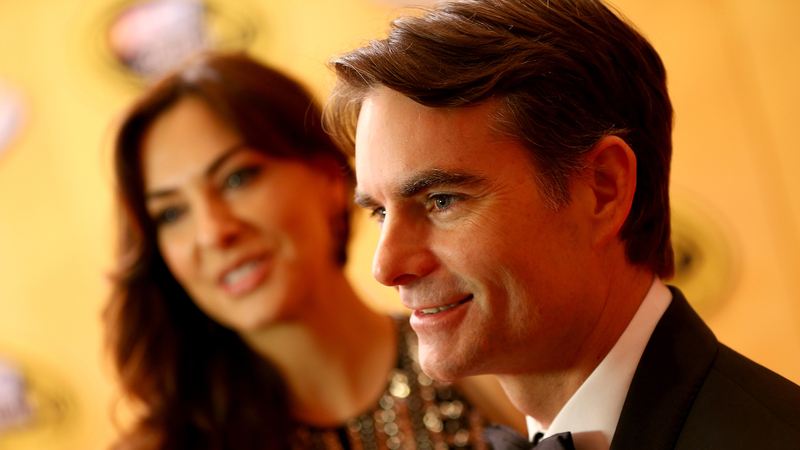 Does this make Jeff Gordon the new Leonardo DiCaprio? We can’t forget Chandra Johnson. She’s been staying behind the scenes during Champion’s Week, but we think she stole the spotlight on the red carpet. Let’s hear from you in the comment section below. Who’s your favorite?